note: this is not my picture. I got it from here. If someone wants to draw me a legit picture, please do. Because of their shocking coat and great height, Twiga have been adopted by the inhabitants of the island as a symbol of spirituality. In colonial folk stories, twiga are often portrayed as vessels of sacred knowledge, and considered to be the first living creatures to communicate with the source of divinity, since they live closer to the heavens than any other animal or person. Many twiga now exist in other parts of Kantebury, including Jhardhandi and Kwazulite, though typically only in captivity. There is a small population of wild twiga in Jhardhandi from when they were initially discovered by the colonists, however hunting has kept the population from growing too large. Twiga are the tallest living terrestrial animals so far to be discovered on Orr, usually standing 3.9 - 5.5 m tall. On average the females are taller than the males. 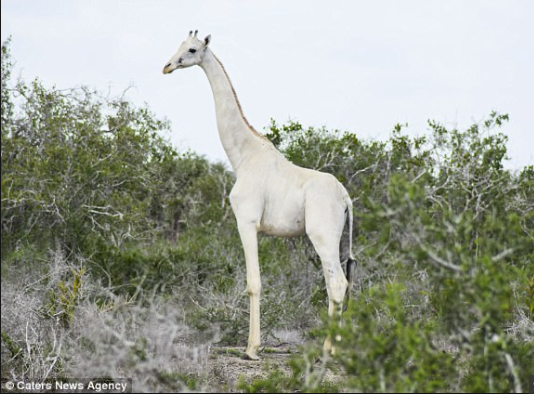 Twiga are easily recognizable by their extremely long necks and legs, ossicones, and bright white coats. They weigh around 1,100 to 1,200 kilograms. The long neck is responsible for much of the animal's height and can be up to 2.5 m in length and this elongation typically takes place after birth. Twiga have bright white coats which can sometimes be spotted with very faint grey geometric markings, though they almost all appear plain white from a distance. They also have large eyes located at the very sides of their head, allowing them great all-around vision, very advantageous to them since they are so tall. The lifespan of Twiga can be up to 25 years, though this lifespan has shortened since their discovery. Twiga live mainly on the island on Tyre, in Kantyre (part of the Kanterbury Empire). They largely inhabit the eastern part of the island. There are open tropical forests and relatively coastal regions, giving them ample space to roam free of woodlands while also providing great food sources. There is a small wild population on Jharadhandi as well, though it is not native to Paorr. Twiga are herbivores. The twiga's diet consists largely of leaves from certain trees. They will also consume buds and blossoms as well as some of the fruits from these trees, such as bananas. Their diet is limited to what they can find browsing at their great height. It is very difficult for them to bend down, so they do not typically consume roots or low growing plants. Twiga usually form small tight-knit herds of about 20 members. The females tend to form strong bonds with one another, so these herds are predominately made up of female twiga and their young. Herd members will form nursery groups to take care of the offspring while other members are keeping watch and eating. Typically these roles will alternate, however older twiga in the herd are normally the ones who will watch the young while younger adults keep watch. Male twiga will usually leave the group once they are old enough to be out of their mother's care. Young adult males will often form temporary groups where they will play with each other, figuring out which among them is strongest, most dominant of the group. Mature males leave these groups and usually spend the rest of their lives alone except during mating seasons. Twiga are typically calm and non-aggressive animals and do have have many forms of verbal communication. Males will make noises during courtship and when in danger, young twiga will also utilize verbal calls to alert their mothers. Nonverbal communication via body movements and posture, holds a more important role within the herds. The females reach their sexual maturity at a younger age than the males, around 4 or 5 years old. Males typically reach sexual maturity at age 9. Twiga are able to mate any time of year, but most often mating begins in the rainy season. The gestation period lasts approximately 7.5 months and gives birth to a single calf. During her lifetime, a female twiga can typically have 4-6 calves maximum.